Investments in the Food & Beverage sectors have helped many Private Equity Groups (PEGs) realize sizeable returns for investors. However, investment professionals must keep Food Safety, Regulation and Compliance top of mind during due diligence and post transaction to preserve capital and mitigate risk. 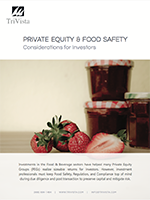 Over the last 10 years, we have seen Private Equity investment activity in the Food and Beverage sectors increase substantially, particularly in the middle market. Entrepreneurs seeking growth capital and liquidity have presented investment opportunities that are ripe for investors, who have also found ample exit opportunities to larger funds, quite often strategic buyers. However, as PEGs have increased their activity, the risk profile of many of these investments may also increase. Investments in the Food and Beverage sectors come with unique compliance and regulatory requirements not encountered in traditional manufacturing and distribution environments, particularly those associated with Food Safety. Conducting Food Safety Due Diligence is one component of a more broad diligence effort. Within a target acquisition, in addition to the standard Operational Due Diligence, investors need to understand that there are critical elements of a comprehensive Food Safety Program (Food Safety, Regulatory Compliance & Quality) that must be assessed, including Management commitment. It is recommended that trained experts be retained to evaluate the Food Safety and Compliance programs so that there is an independent review of adherence to internal programs conducted, as well as verification of industry best practices.